Let’s get an important issue out of the way first: Dale Thayer. Both the Herald-Sun and Indy Week are reporting that he was taken out of the game because of tightness in forearm (Indy Week)/throwing arm (Herald-Sun). Very worrisome moment last night. While on the topic of Dale Thayer, we are wondering if he’s been working hard enough (able to work hard enough) this year? It may be too late, if this is a disabled list-type injury. By this time last year Dale had made 28 appearances for 36 innings with the Bulls, and 3 appearances for 5 innings with the Rays. This year he’s at 26 appearances for 31 innings. Not his fault, of course, Montoyo is trying to balance things out for a bullpen that has not been overworked this year. Nevertheless, Dale has been out there only three times since his very tough one inning (5 earned runs) down in Gwinnett on 14 June. Have to wonder if there was something wrong with his arm even then. Brian Baker did a wonderful job last night, and all credit to him. He could also be a poster child for why stats geeks don’t like to use won-lost records to evaluate pitchers. Brian’s got a 6-0 won-loss record, but four of those wins are in relief and he got one of the wins for pitching all of ⅔ of an inning. Which is not to take anything away from last night, or his fine start up in Indianapolis on the 21st. Great job. Is the real Justin Ruggiano showing up? Two singles (one RBI) Friday night, double and home run (two RBI) last night. Cross your fingers. Maybe, just maybe. Sure would be nice. Fernando Perez keeps flirting with the Mendoza Line. On the other hand, he had a triple Friday and a terrific line drive home run last night between the 375 and 450 markers. Our broadcaster insisted it went through the “bicycle rack” fencing (and thus a ground rule double). Ended the night at .204. Chris Richard got a single in the 7th inning to end a long dry spell. In fact, everybody got a hit last night (Ruggiano, Dillon, and Jennings got two each), making it one of those nights where everyone has a chance to feel good. The Bulls are 15 games above .500, the best we’ve been all year. Lest we get too puffed up about that, though, note that last year we hit that spot on 1 June and we were 1½ games behind Norfolk in the South Division. We did, as fans will recall, end up 22 games above .500 and Norfolk dropped down to exactly .500 by the end of the season. At least one blogger (actually a reporter for The Morning Call) writes about the Iron Pigs. The Hog Blog. 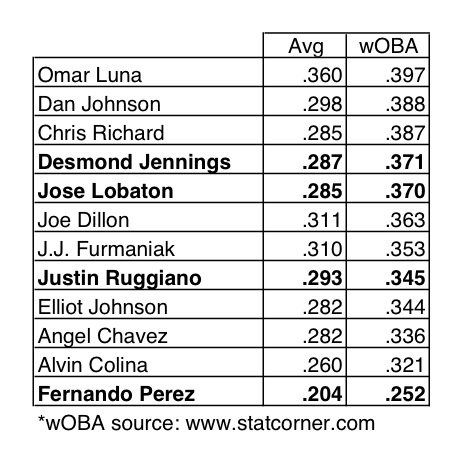 And here’s an updated table on our position players, mostly to show off that I think I’ve figured out how to get a table into this blog. A couple of notes: Players on the Rays’ 40-man are in bold. Furmaniak and Luna have very few plate appearances, so their numbers can be expected to drift downwards. 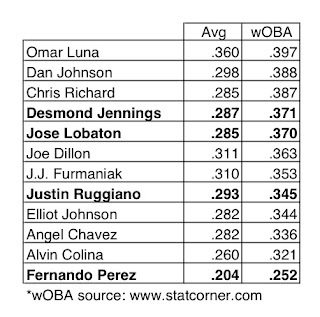 Table sorted by wOBA. I hope Dale Thayer will be back soon. Maybe this might explain the last couple of rough outings.